North India temple tour is special tour itinerary for those who wish to explore most famous religious sites of North India in a span of 8 night / 9 days. The northern region of India is dotted with several places of worships, which is highly revered as well as architectural wonders. If you wish to explore these religious sites of North India and more, opt for the well-planned North India Temple Tour package, spread in the duration of 8 nights and 9 days. Along with Delhi and Agra, the itinerary takes you to popular holy cities of north India like Haridwar, Rishikesh, Varanasi, Sarnath and Mathura etc. On arrival in Delhi, our tour representative helps you with an assisted transfer to the hotel. If time and energy permit, you can explore the surroundings on your own. The capital city of India, Delhi is a concoction of varied cultures, an amalgam of old-world and new-age charm. The place is dotted with several architectural wonders. On day 2, get ready for the city tour of Delhi. Some of the most popular attractions of Delhi that you visit today are Parliament House, India Gate, Swaminarayan Akshardham temple- dedicated to Bhagwan Swaminarayan, the temple is a wonderful piece of traditional style of architecture, and Laxmi Narayan temple- also known as Birla temple, built in 1938, this temple is dedicated to Lord Vishnu and his consort, Goddess Parvati. The second leg of sightseeing continues after lunch. Explore the UNESCO World Heritage Site of Qutab Minar Complex. The next visit is to the very popular Chhattarpur Temple- the second largest temple complex in India, it is dedicated to Goddess Katyayani (Durga). Stay overnight in Delhi. Today, in the morning, get transferred to the New Delhi Railway Station for boarding the train to Haridwar. As you reach at Haridwar railway station, de-board the train and meet our tour representative. 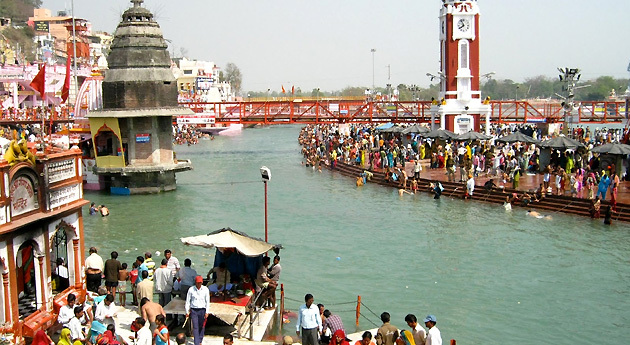 The first place where the mighty Ganges hits the plains, the holy city of Haridwar has a distinct spiritual feel to it. 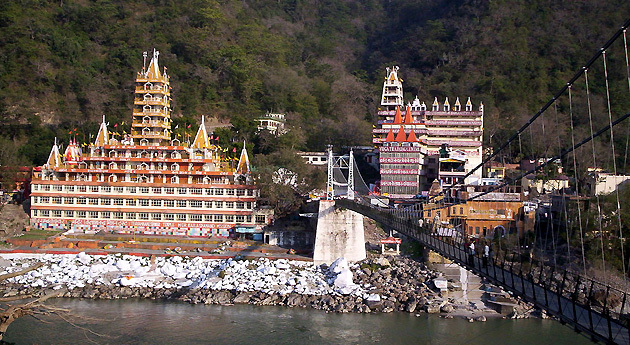 Here, you visit the very popular Har-ki-Pauri, which probably is the most popular bathing Ghats of River Ganga. It is also the site of evening Ganga Aarti. Later, visit the other popular temples of Haridwar. Thereafter, start driving to Rishikesh. Upon arrival, complete the check-in formalities at the hotel. The evening is schedule for Ganga Aarti, a memory worth cherishing. On the 4th day of the tour, the morning is at leisure. Thereafter, you get transferred to the Haridwar Railway Station for going on-board the train for the sacred city of Varanasi. Early morning arrival in Varanasi, our tour representative meets for an assisted transfer to the hotel. After the check-in formalities, the day is at leisure. Also known as Banaras, Varanasi lies on the banks of Ganga River. 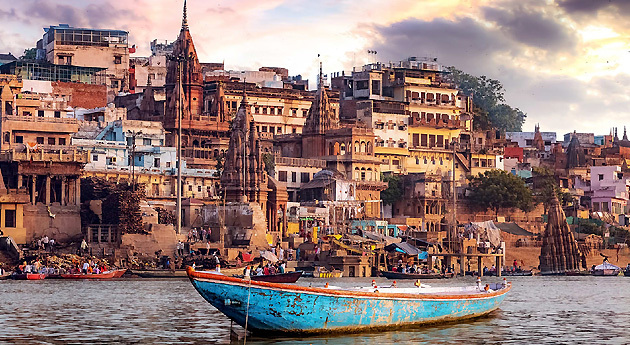 One of the seven holiest cities of India, Varanasi has everything to connect you to your inner self and peace. Varanasi also sells fine-quality silk saris. Roam around, soaking-in the spirituality. Start your day with an early morning boat ride in the Holy River Ganga. A quintessential Varanasi experience, this boat ride lets you see the locals indulged in their morning religious rituals like performing Pooja, taking a dip in the holy waters, and so on. This boat ride is generally of an hour. Back to the hotel for breakfast. Get ready for exploring the ancient Buddhist town, Sarnath. Around 13 km north-eastwards of Varanasi, Sarnath has several structures related to Buddhism including the Museum, Stupa, and the Buddhist temple. One of the most popular attractions here is the deer park, the site where Lord Buddha gave his first sermon after enlightenment. In the afternoon, back to the city for sightseeing including the Bharat Mata Temple- constructed in 1936, this temple is dedicated to Mother India, Durga Temple- also known as Durga Kund Mandir, it is believed to be 500 years old, Aurangzeb Mosque, which is also famed as Gyanvapi mosque and Benares Hindu University- founded in 1916, it is one of Asia's largest residential universities. On day 7, the morning is free for leisure activities. Indulge in the activities of your interest. You can visit the local market for buying some souvenirs or tasting the lip-smacking street food. Later, in the afternoon, move to the Varanasi Railway Station to board the train to the Mughal city of Agra. Overnight on-board. Early morning arrival in Agra. De-board the train. Our tour representative greets you and helps you with an assisted transfer to the hotel. Complete the check-in. Later, get ready for a sightseeing tour of Agra. The erstwhile Mughal capital, Agra is dotted with several architectural masterpieces. Some of the tourist attractions that you visit today include UNESCO World Heritage Site of Agra Fort and one of the 'Seven Wonders of the World', Taj Mahal. Taj Mahal was erected by Mughal Emperor Shah Jahan in the memory of his beloved wife Mumtaj Mahal. 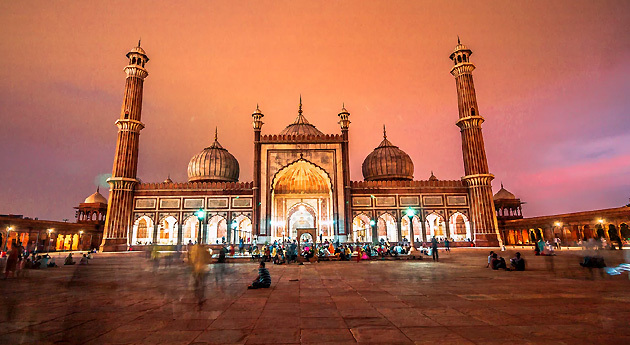 The next attraction of the day Itmad-Ud-Daulah tomb. Also known as 'Baby Taj', it was built by Empress Noor Jehan in the memory of her father. Stay overnight. In the morning, start driving to Delhi by road via Mathura. Mathura is a religious town that is known for being the birth place of the beloved Lord Krishna. After exploring the popular religious sites, continue your journey to Delhi. Once you are back to Delhi, visit the popular markets of Chandni Chowk and Connaught Place. Dinner at a popular city restaurant. Later, get on-time transfer to the international airport to board flight for onward destination.